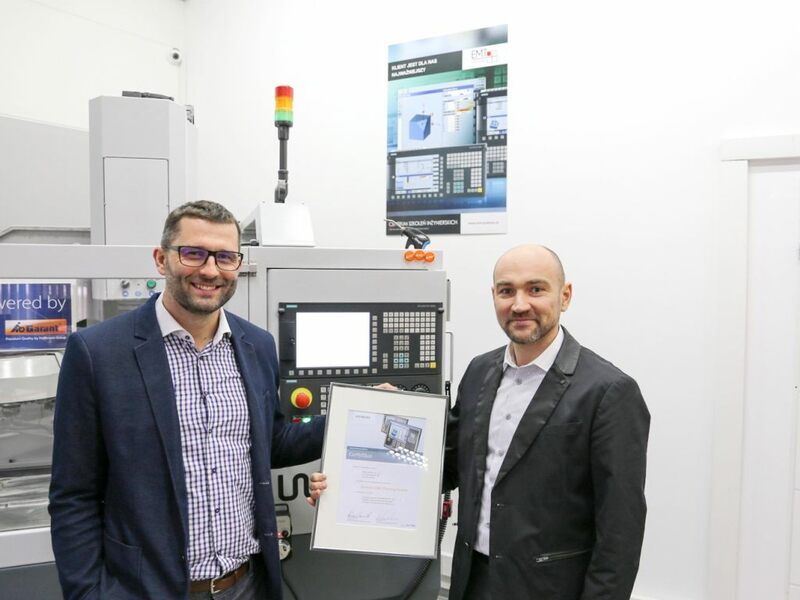 At the beginning of 2016, our Training Center was granted the title of Siemens CNC Training Partner. 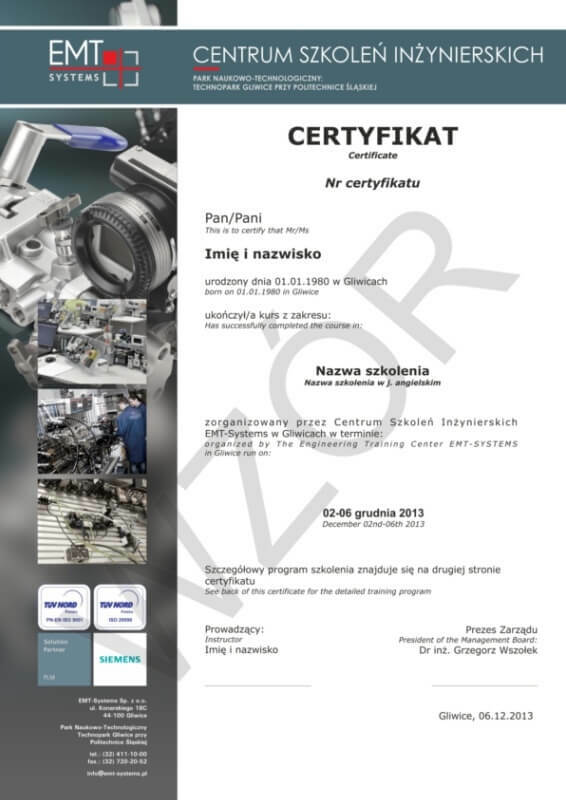 Following the contract signed, we became the authorized training partner of Siemens Polska – Digital Factory Motion Control division. 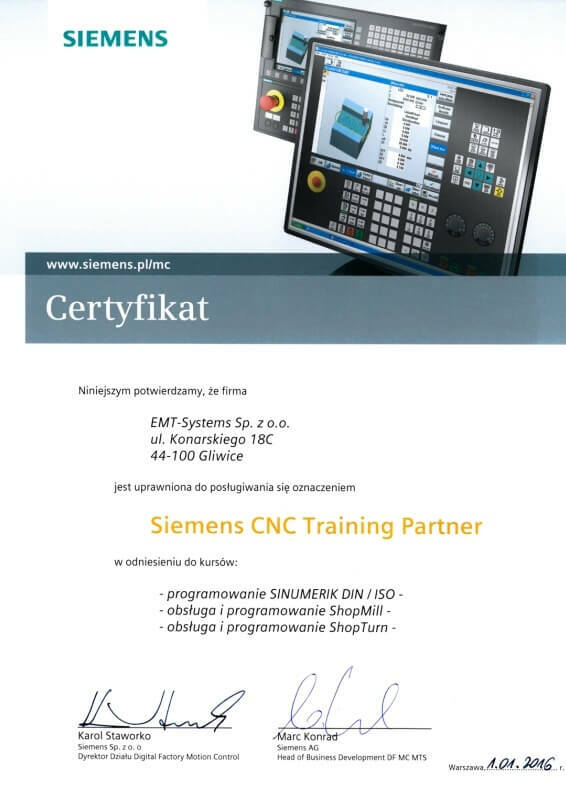 Certification process entailed training our employees and granting them the title of Siemens CNC Trainer. 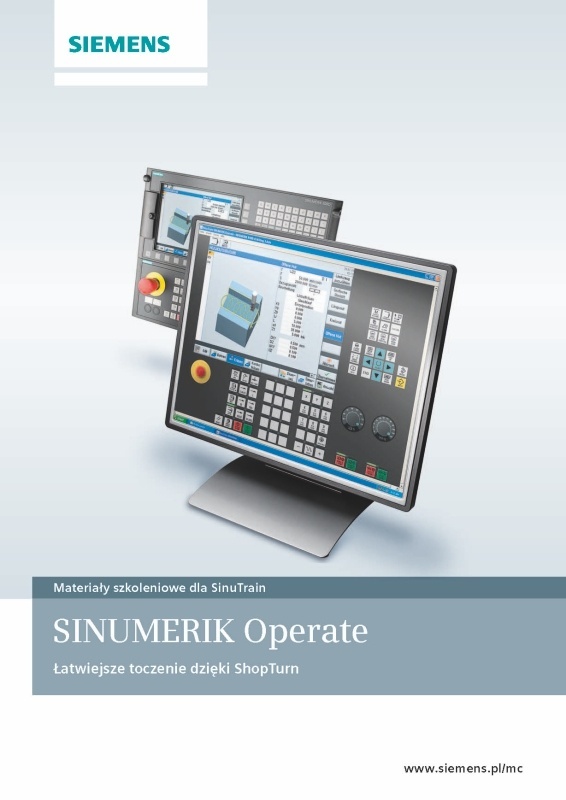 Our partnership with Siemens allows organizing trainings in the following areas: DIN/ISO Sinumeric programming, ShopMil operation and programming, ShopTurn operation and programming. The Engineering Training Center EMT-Systems Ltd. is the authorized training partner for MITSUBISHI Electric Europe B.V. In view of constant improvement of our training services we would like to offer you the opportunity to get your competence certified by the independent certifying body TÜV NORD Polska. Participants will take an exam on the last day of training, having completed the training sessions. The exam will be organized once the minimum required number of candidates is reached. Applying for TÜV NORD certification is voluntary. Regardless of TÜV NORD certificate, each participant receives a course completion certificate issued by EMT-Systems. This certificate is also recognized and respected both in Poland and abroad. TÜV NORD Polska is an independent certifying body authorized to assess and certify standards and competence. Certification enables you to demonstrate your skills and qualifications to future employers or business partners. Applying for TÜV NORD certificate is voluntary. Regardless of TÜV NORD certificate, each participant receives a course completion certificate issued by EMT-Systems.This certificate, prepared in Polish and English and signed by the authorized persons, is also recognized and respected both in Poland and abroad. Certificates are awarded to the participants upon passing the written exam held by the independent certifying body TÜV NORD Polska. In order to take part in the examination it is necessary to complete the course and make a payment (fees are specified in the price list) to the bank account provided in the application form. Certificates are valid for 5 years. After this period, in order to maintain the certificate the holder must prove to be using skills acquired during the course in their work. This process ensures constant development and knowledge improvement. 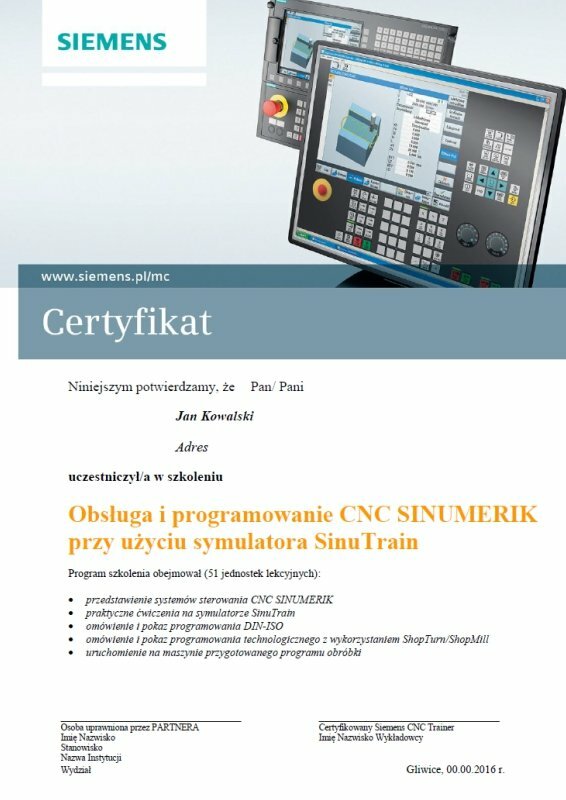 In October 2014 EMT-Systems, after verification performed by the committee appointed by the Education Office, was granted accreditation from the Silesian for providing continuing education in non-school educational institutions: “The course of operating and programming numerically controlled machine tools – CNC Operator”. Accreditation is one of the external ways to ensure the quality of education. Obtained accreditation is a confirmation that the facility meets the set requirements and accepted quality criteria. 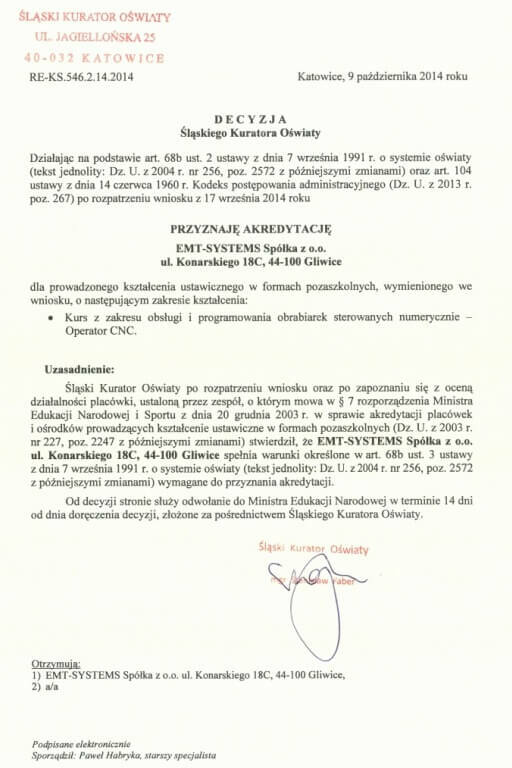 After the “CNC1 – operation and programming of numerically controlled machine tools – CNC Operator” training, students receive a certificate issued pursuant to § 18th paragraph. 2 of the Regulation of the Minister of National Education of 11th January 2012 on lifelong learning in school forms (Dz. U. of 2014. Pos. 622).